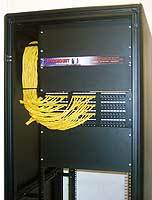 We recommend network rack enclosures for safety, durability, and aesthetics. operation in today's fast paced, world wide marketplace. Based on an analysis of your networking needs Consys consultants will provide hardware, software and service to install a comprehensive and effective network solution. Consys offers solutions that include routers, switches, firewalls, gateways, hubs, cabling, computers, software, and Internet connections. Network cable routing in server rack enclosure. Consys has extensive experience is seamlessly upgrading legacy network infrastructure to more flexible technology. Whether you are adding to an existing network, or doing a major restructuring, Consys will provide valuable advice on all aspects of your new and existing hardware. Consys consultants will provide a full analysis of your networking requirements including usability, platform type, budget, performance, security, data value, backup, power protection, expandability, etc. We recommend and install Draytek Vigor router / firewalls. They provide features only found in products that cost 2 to 4 times as much. Lynksys partner for reliable switches, gateways and routers with lifetime warranty. We install and maintain both wired and wireless computer networks for numerous clients.